Israeli Prime Minister Ehud Olmert has said he is making "extraordinary efforts" to start peace negotiations with Palestinian leader Mahmoud Abbas. 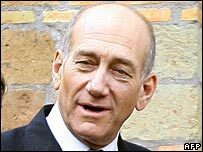 In a BBC interview, Mr Olmert said Israel was prepared to "pull out from many, many territories". He reaffirmed his support for a Palestinian state and said a new border would have to be determined, "hopefully through negotiations". Mr Abbas - also known as Abu Mazen - has called for peace talks with Israel. "I'm making extraordinary efforts now to try and reach that kind of understanding with Abu Mazen that will allow both of us to start open, bilateral negotiations," Mr Olmert told the BBC. He said he was "very hopeful" that talks would go ahead "in spite of the difficulties that he (Mr Abbas) experiences all the time". Israeli officials have said Mr Abbas is well-intentioned, but restricted by the government led by the radical group Hamas. Mr Olmert said talks would not be easy because the Palestinian Prime Minister, Hamas' Ismail Haniya, was "not prepared to make any move towards peace". Hamas has resisted international calls to reject violence and recognise Israel.